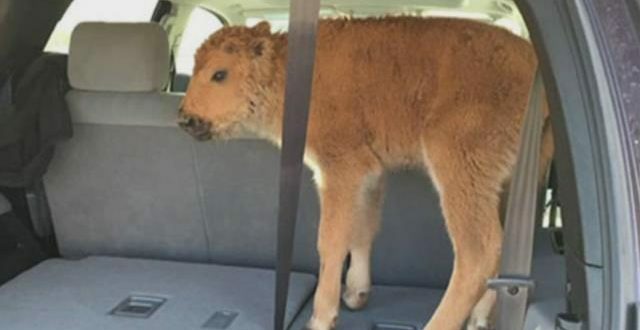 A tourist received six months of probation after pleading guilty Thursday to putting a bison calf in his car at Yellowstone National Park because he thought the animal was cold. The calf later had to be euthanized because it couldn’t be reunited with its herd. Court records show Shamash Kassam of Quebec entered a guilty plea over the telephone on Thursday to a wildlife violation. U.S. Magistrate Mark L. Carman ordered the penalties, which include a $200 fine and a $500 payment to the Yellowstone Park Foundation Wildlife Protection Fund. A criminal complaint states that Kassam came across the bison calf on May 9 and put it in his vehicle out of concern for its welfare. Wildlife officials across the country almost always encourage people who have attempted a rescue to return the animals exactly where they found them, because mothers are likely to return to their offspring after searching for food or hiding from predators. People are also told to put the animals in a nearby area if they are at risk of being attacked by a pet. People are also encouraged to use gloves while handling the animals and avoid hugging them to prevent their “human scent” from transferring, which could be a giveaway to predators.